Tjeldoya Island looks deceptively empty. On the day we drove to Lodingen we were on the opposite side of the fjord and Amanda pointed out that there are many houses on the shore of Tjeldoya that you don’t see from the narrow road where one driver often has to pull over when two vehicles meet. Car coming. Who will pull over? Despite this rural setting, there are quite a lot of people on the island, especially in the summer, and many communities hold events. Kjerstad is active, holding a Sunday cafe in the small building that works as a community center. On Sundays from noon-3 pm you can stop in for waffles or pancakes with jam and sour cream to top them and a beverage (soda, coffee) or an ice cream. The few indoor tables have been full and the heaters running when it was cold out this week, but lately people sit in the sun on outdoor benches and picnic tables. I took advantage of the women who run the event to find out the answers to my recycling questions (!) and we chatted about the weather. Even the woman who said her English wasn’t very good spoke excellent English. During the week we saw a new poster on the building. After some searching and translating, we found that it is by a theater group that tours northern Norway in the summer, performing plays that incorporate elements of Norwegian history. At the following Sunday cafe, when we went with Amanda and Jimmy, we found out more. One of the actors in the theater group is from Kjerstad, part of the reason it is a stop on each summer’s tour. (He’s the one holding the fish.) I am so sorry we will miss this. The third week, we returned to the cafe with Paula, and met the actor’s brother, who lives in Kjerstad. Each week we learned something new. We also went fishing off the pier after finishing our waffles. 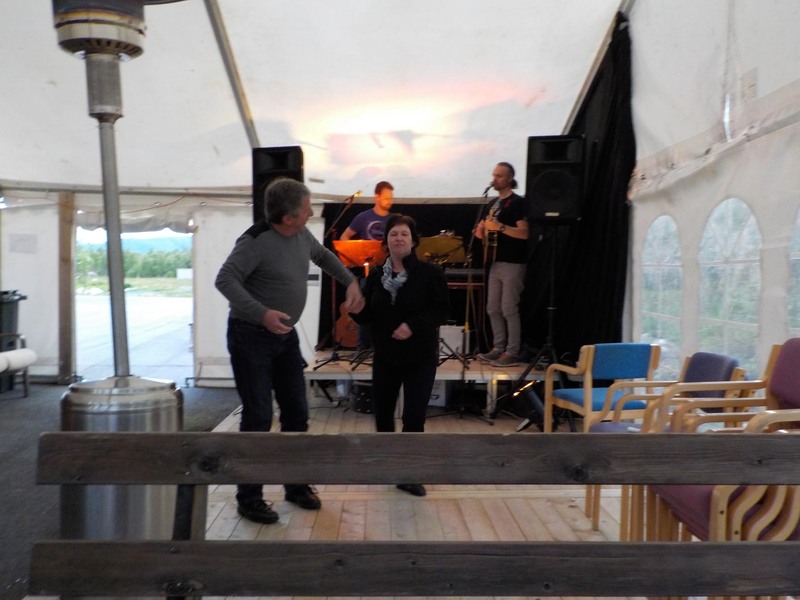 Last Saturday night was a pub night at the same place in Kjerstad, the community center. We were told it began at 9 pm, so we arrived at 9:30 pm. We were almost the first people there, but we got drinks and sat down and chatted with two men who turned out to be the musicians. 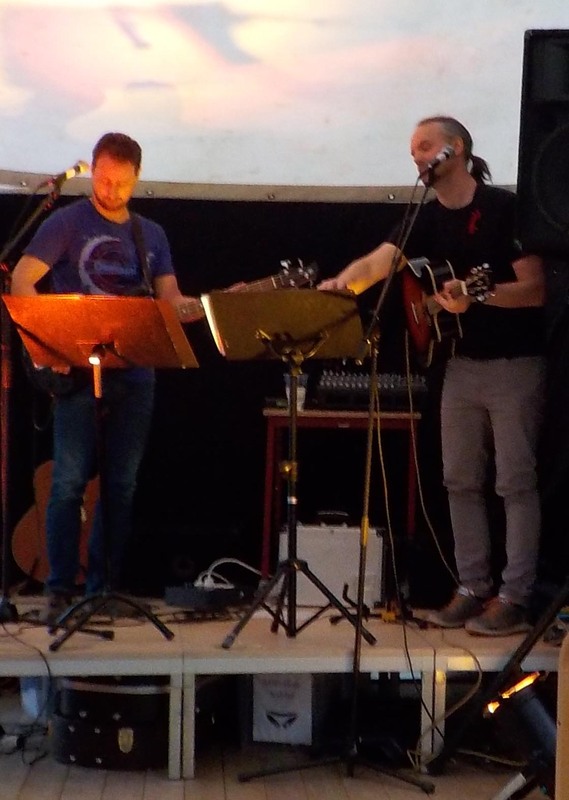 Both are teachers in Harstad, one focusing on English though teaching other subjects, most recently to 6th graders. The other teaches a range of subjects to middle and high school students. They play for fun and pocket money. This was a last minute event for one or both of them. Someone cancelled somewhere along the way and one or both of them were a last minute addition. It didn’t matter to us because they were very good, playing bass and guitar and singing, mostly in English! The songs were familiar rock tunes. I’m sorry there was only one of these events during our stay. We left them to tune up and took seats for the music. There was some wrangling about the space heater. 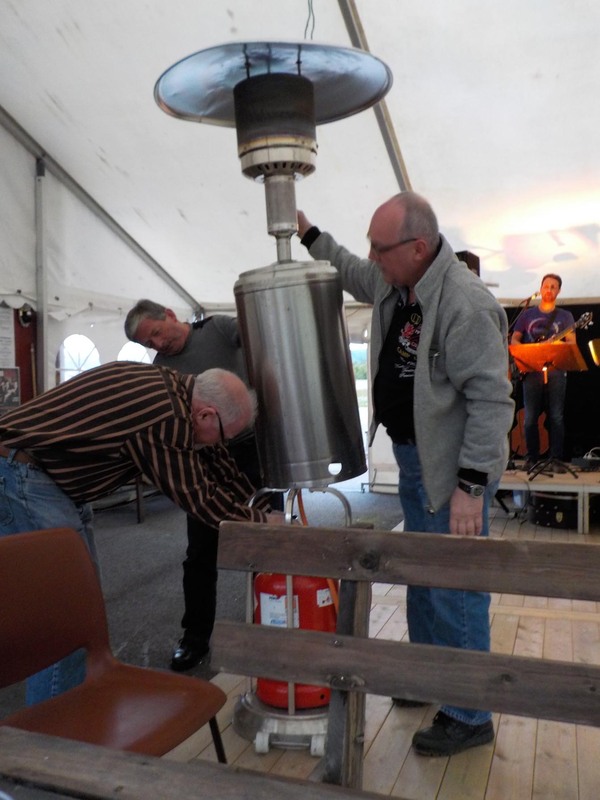 (How many men over 65 does it take to start a space heater?) I’m not sure. They were not crazy about the foreigner figuring it out, but later we all toasted one another. We’d be dancing with them if Jonathan hadn’t sprained his ankle. Jonathan recognized a woman at the next table from when we turned around in her driveway (How did he do that?) and we had one of those funny conversations, “Oh, YOU were the ones in the dark car!” “Yes, that was us.” “I was mowing the lawn.” “Yes, on that riding mower.” “Hello.” (We shake hands and smile). Then we discussed how we happened to be in their neighborhood–Dragland–yet not related to anyone there. It seems that most people visit because they have a relative there, so our new friends assumed we must be some newly arrived relation of a Draglander. Since we had this conversation, I found that there is an Association of people named Dragland who are actually from Dragland. They all have a common ancestor. The next day was our last Sunday cafe before leaving, and I asked if I could have a photo with the ladies who run it. They were all delightful. 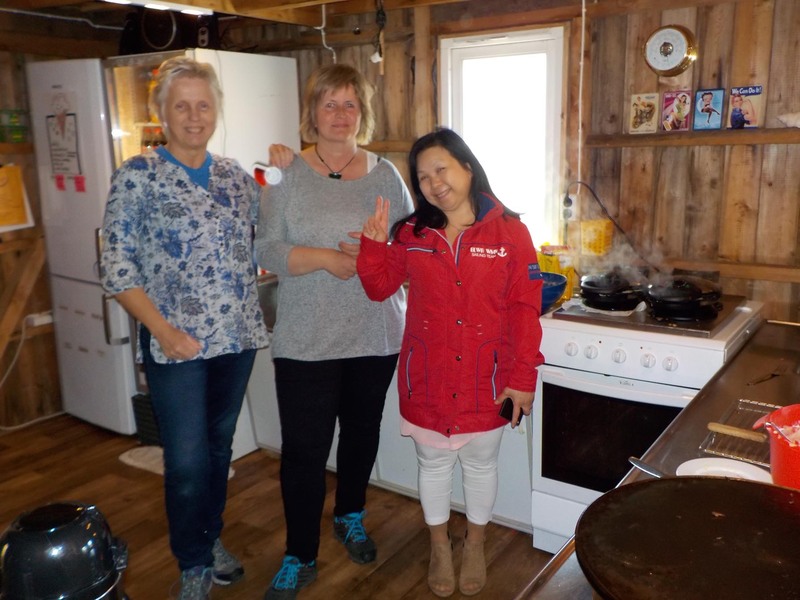 The woman on the left is from southeast Norway and said that though it appears isolated, people of the north have always been able to fish, and never starved like her ancestors who were farmers. She shook her head as she described her grandmother, poorly nourished, with ten children, not all of whom survived. I mentioned the bread made with crushed tree bark to extend the flour that was made in Sweden during famines. “Oh, yes, bark bread. They made that in Norway, too.” Fortunately, times have changed. How much we appreciate their community events!